Every spring, the melted snow fills the riverbeds, opening the way back home for the salmon after a life swimming in the oceans. 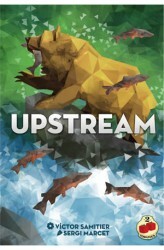 In Upstream, each player controls a bank of salmon swimming upstream to lay their eggs where they were born. During their journey, they will face hungry bears, fierce birds of prey, and patient fishermen, all of which they must avoid in order to survive. These are not the only hazards the salmon must face as each round of play the strength of the water flow will cause some pieces of the river to fall back, making it impossible for some fishes to make their way upstream. The game is played in rounds, with each player spending five points among their salmon tokens in order to move them, either swimming or jumping across the hexagonal tiled river. At..